If you’re learning about essential oils, you’ll often hear talk of “carrier oils,” especially when using oils on kids, the elderly, or those with sensitive skin. 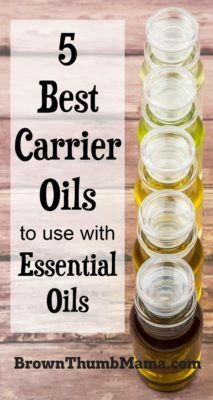 Choosing the best carrier oil is an important part of your essential oil knowledge base. Carrier oils for essential oils are pure vegetable oils that help essential oils penetrate the skin. They’re typically produced from the fatty portions of a specific plant (coconut oil, olive oil, etc). Carrier oils don’t evaporate like essential oils do, and carrier oils can spoil or go rancid over time. If you’re using an essential oil or blend frequently (like the allergy trio), it’s helpful to mix the essential oils and carrier oil in a roller-top bottle. The essential oils and carrier oil will combine and you can apply the mixture wherever it’s needed. 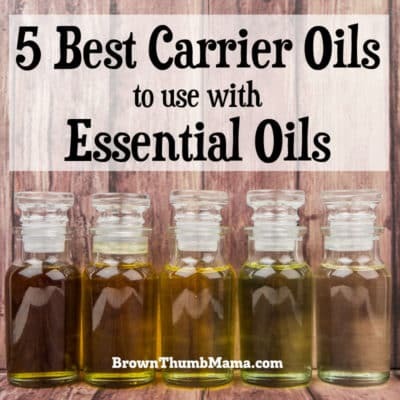 Here are my favorite carrier oils for essential oils and the added benefits/nutrients of each. Also called Liquid Coconut Oil, this universally popular carrier oil (buy it here) is colorless, odorless, and absorbs easily into the skin. It’s created by treating traditional coconut oil with hydrolysis and steam distillation. Fractionated coconut oil stays liquid and has a very long shelf life. It’s moisturizing and contains natural antioxidants, making it a perfect match with essential oils. This oil is not sweet in flavor, but is labeled this way to differentiate it from bitter almonds (which contain cyanide). In the US, all commercially sold almonds are sweet almonds. Sweet almond oil has no fragrance, is great for skin, and contains 200% of the recommended daily allowance for Vitamin E.
I was surprised to learn that jojoba oil is not an oil but a liquid wax! It’s excellent for hair and moisturizing the skin. Jojoba oil has soothing and healing properties because it contains iodine. Like fractionated coconut oil, it has a long shelf life. As you may suspect, this light, odorless oil is made from grape seeds, and is an abundant byproduct of wine making. Grapeseed oil contains some Vitamin E and is full of moisturizing fatty acids, so it’s good for your skin. The most delicate of the carrier oils, choose avocado oil that’s unrefined and cold-pressed. It’s good for skin and hair but typically has only a 6 month shelf life. Please don’t use mineral oil (at all). A byproduct of petroleum production, it’s used in many commercial products because it’s cheap to make. But it clogs pores, prevents the skin from breathing naturally, and prevents essential oils from absorbing. If you have it—toss it! what do you think of baby oil? do you recommend using it with essential oils? I don’t recommend using baby oil because it’s a synthetic product that actually clogs the pores. 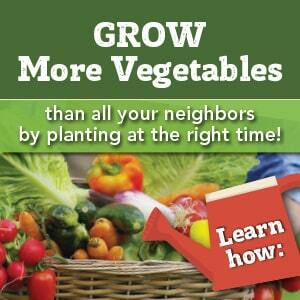 Much better to use a natural oil like coconut oil or grapeseed oil! How is olive oil for mixing with essenial oils? Diana, it will work just fine but the combination of olive oil’s scent plus the essential oils might not be too great. how do you learn what and how to mix a carrier oil with a essential oil & the right mixture please?